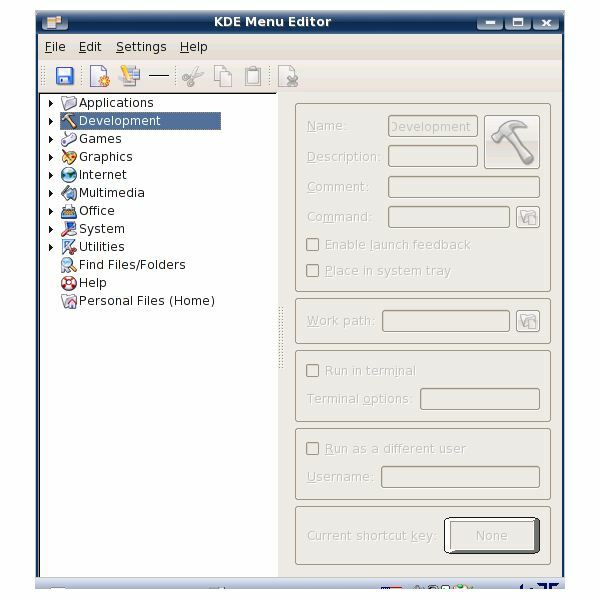 In this dialog you can select the general options for the KDE menu. For instance, you can select what to display for each menu item. The possible choices are to display only the name, to display the name and the description, only the description, or the description and optionally the name. Most likely you would choose to display the name only but if you have name programs with cryptic names, you might want to display the description as well, so that you know what each program is supposed to do. This dialog also allows to choose whether to show a side image in front of the menu item or not, to show or hide some of the optional menus, such as Bookmarks, Find, Recent Documents, etc. You can also specify some other options, such as the number of the most recently/most frequently used applications. When you are done, click Apply to apply the changes and OK to close the dialog. The KDE Menu Editor dialog contains a list of all the submenus and menu items you currently have. You can edit existing menu items and submenus, if you click them on the list in the left pane. When you click a submenu, it will display all the menu items in it and you can edit them from the dialog in the right pane. Depending on your access permissions (i.e. if you are logged in as root or as an ordinary user), different options will be enabled. The options you can edit are the name of the menu, its description, comment, command, etc. If you are logged in as root, you will be able to set the work path, whether to run in terminal or not, and the user who will be able to run it (besides you). As you see, there is quite a lot you can do to customize the menu in KDE and this applies not only to the existing menu. If you have installed new programs, which don’t appear in the menu, or if you want to set alternative run options for an application, which is currently in the KDE menu and you need a second entry for the same application but with different parameters, you can add new menu items and submenus. From the KDE menubar, select Edit → New Item or Edit → New Submenu to enter a new menu item or submenu, respectively. If you want to add a new separator in order to make your KDE menu neat, use Edit → New Separator. In addition to adding new menu items and submenus and editing existing ones, you can also delete the ones you don’t need. However, be very careful what you delete and pay attention not to delete a vital menu entry. Still, if you are sure that you want to delete a menu item or a submenu, select it in the left pane and click the Delete icon (the last icon in the buttonbar right under the menubar of the KDE Menu Editor dialog).